The Blue Jay (Cyanocitta cristata) is the most abundant and well-known jay in the United States. It has a blue and white patterned body and prominent blue crest. It is a year-round resident in all U.S. states east of Arizona and in Canada north to Newfoundland. 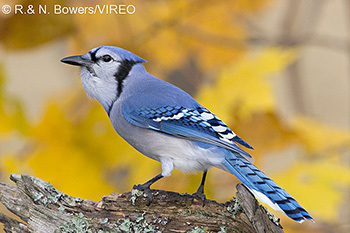 Like other members of the "corvid" family, which includes crows and magpies, the Blue Jay is a robust, loud bird, known for aggressive behavior toward other birds. John James Audubon's famous painting depicts jays eating the eggs of Mourning Doves. Fortunately, the eggs and young of other birds form only a small portion of the Blue Jay's diet. The Blue Jay has a variety of vocalizations: a loud, descending "jeer" (an alarm call that often summons other jays to harass or "mob" a nearby hawk or owl), and a mechanical-sounding "teedle, teedle, teedle" and "kee-duh-duh". The jay also imitates the calls of Red-shouldered and Red-tailed Hawks. Blue Jays are permanent residents in all of the U.S east of Arizona, and in Canada north and east to Newfoundland (except for the southwest Canada). Large flocks of Blue Jays migrate diurnally within this range; several thousand fly over Cape May, New Jersey on a fall day. The Steller's Jay in the western U.S. and Canada has a gray-black head and upper back and no white markings. The Pinyon Jay of the southwest U.S. also lacks the blue crest and white tail and wing markings. The Blue Jay nests at varying heights in trees at the woodland edge and in cleared areas. The bulk of the Blue Jay's diet consists of nuts, acorns, seeds, insects, and berries. The bird is one of a number of species that performs the ritual of "anting": grabbing live ants with its bill and distributing them in its wing feathers, apparently to use the formic acid as a miticide. The bird collects and "caches" or hides acorns in trees for sustenance during winter, and it can carry three acorns at a time in its throat and bill.